You are here: Home / Jewelry / Earrings / Pretty pinks: coral and diamond jewelry. 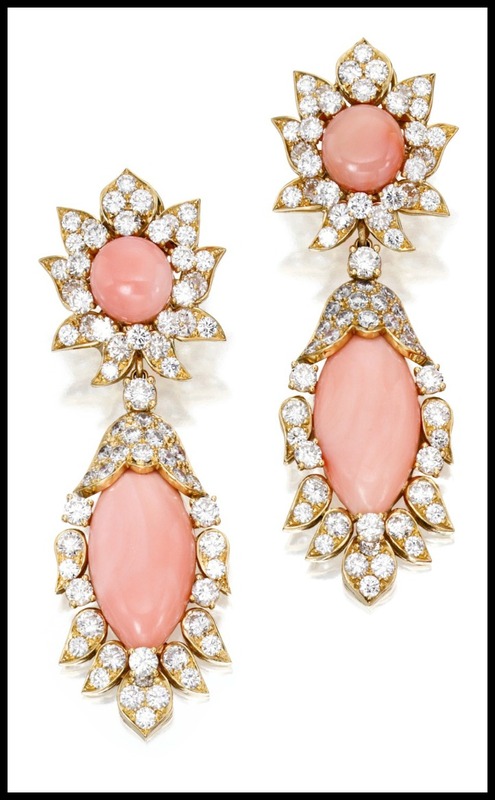 Pretty pinks: coral and diamond jewelry. Pink is my favorite color. I know it’s a little cliche, but I can’t help what I like. It’s just so happy and pretty. Today we’re going pink and sparkly with two pieces of coral and diamond jewelry from a recent Sotheby’s auction. 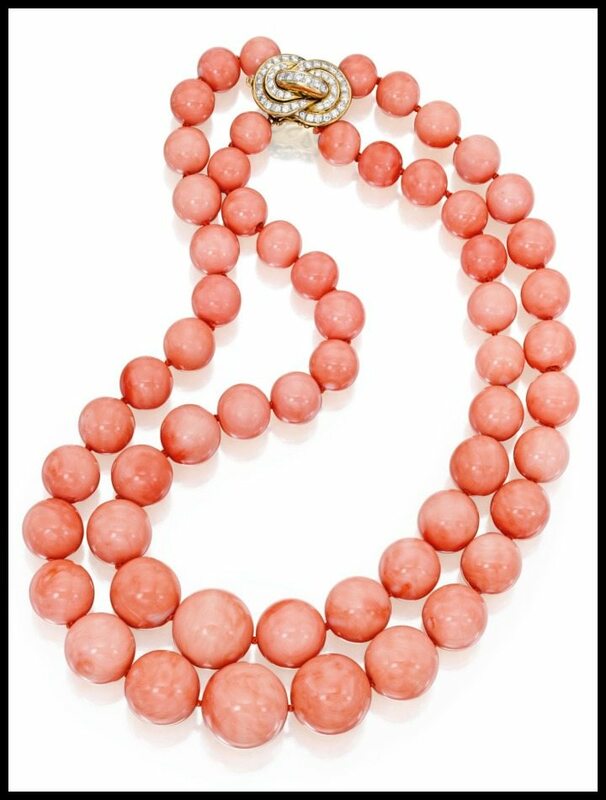 Aren’t the coral beads of this coral and diamond necklace the most wonderful creamy color? It’s really more of a choker, it’s only 13 inches long. The double-strand necklace still comprises 58 beautiful polished coral beads, joined in the back by an 18 karat gold and diamond clasp in the shape of a knot. These fabulous coral and diamond earrings are by Van Cleef and Arpels. Two small coral cabochons on the surmounts and two larger ones on the lower sections framed by 18 karat gold embellishments set with 11.50 carats of diamonds. I love how the vaguely petal-like shapes of the gold setting evoke a floral feeling without being too on-the-nose. This pair by Bulgari is actually my favorite of the lot. I think the long pink coral drops hanging from the vivid emerald surmounts wreathed in twinkling diamond are simply glorious. What do you think of these pieces? Would you wear any of them? These beauties were both listed in a recent Sotheby’s auction. All images and info are thanks to Sotheby’s. Please see individual descriptions for source links. Embrace the pink! Don’t apologize! I love pink jewelry but can’t wear it well because I’m pink- but I sure like it. These are lovely. I have the same problem with actually wearing pink jewelry: even rose gold sort of blends into my skin. I would make an exception if I ever got hold of any of these, though!